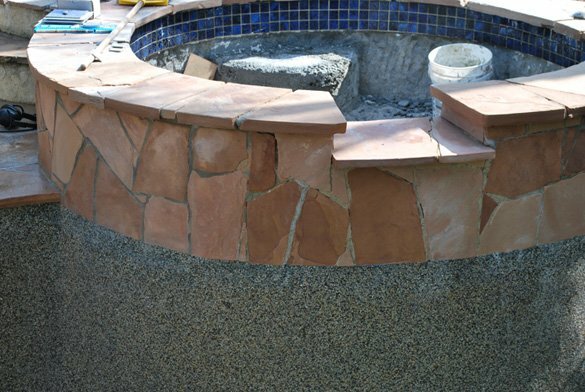 A homeowner in the Sabre Springs area of San Diego asked us to advise them on what could be done to their swimming pool and spa as part of their backyard remodel. The home has a small to medium size pool with a raised attached spa. 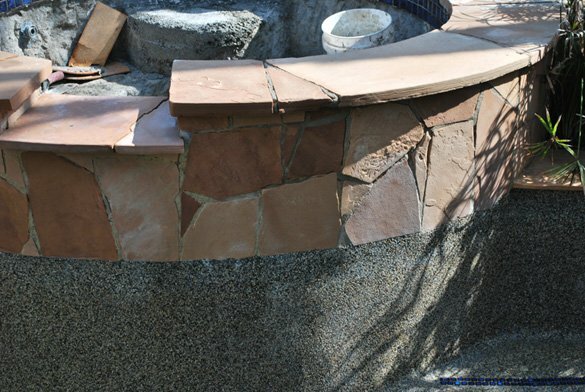 Both have a pebble surface and tan flagstone coping and spa spillover. 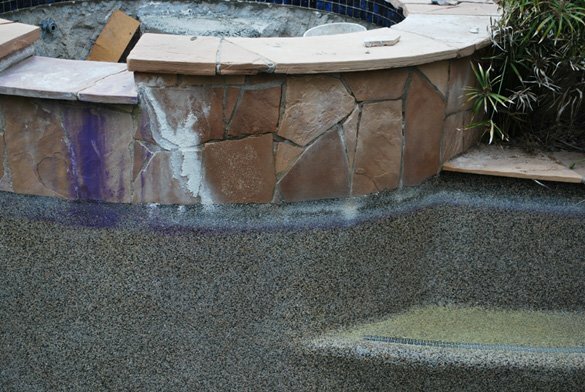 The pebble at the water line in both the pool and spa was covered with calcium and a haze. 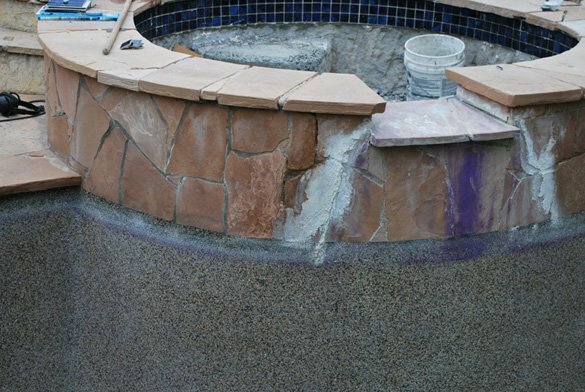 The tan flagstone on the spa spillover had both calcium and purple staining on it. 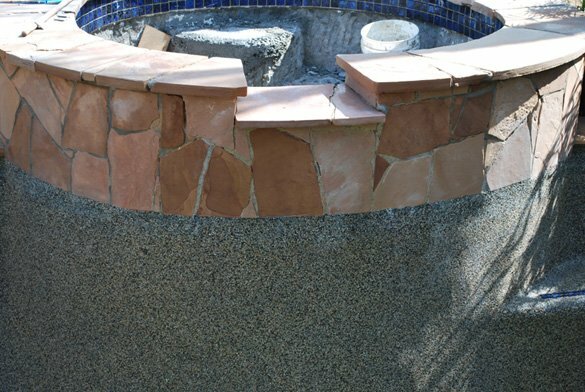 The homeowner decided to have the inside of the spa remodeled while having the calcium removed from the water line and the spillover stone. 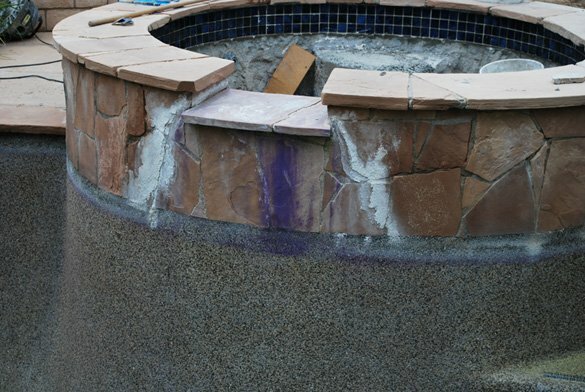 We were informed by the homeowner that the purple staining was from a magic marker which was left in the spa that broke. To find the cause of the calcium build up we tested the water chemistry. The decision was made to drain the water. After the pool was empty we used our tile cleaning system to remove the calcium and staining. Once the water line and spillover were cleaned we refilled the pool with water. When the job was completed we shared water chemistry information with the homeowner to help prevent the calcium scale buildup from occurring in the future. This information included the use of Jack’s Magic Magenta Stuff as a stain and calcium preventative.